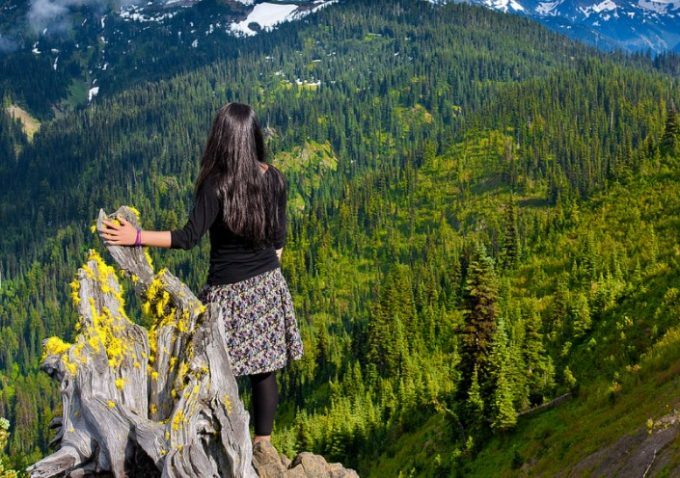 It is a well-known fact that women love hiking as much as men. Women have conquered the heights of the world’s greatest mountains like Everest and Denali as well as the depths of the Grand Canyon and the lengths of the Appalachian Trail. And women are different in their likes, requirements, and passions. Sometimes a girl likes to look like a girl even on the trail. There are advantages to wearing a skirt; better ventilation, easier to use the loo, more freedom of movement to name a few. We are going to investigate the best hiking skirt. We will discuss various features and the best use for each one. Before we move on, it will be good to remember there are skirts for men called kilts. There were worn on a regular basis only a couple hundred years ago. Skirts definitely have a place no matter what the gender! There are many designs of hiking skirts. The ones we are looking at in this writing include miniskirts, knee length skirts, and skirts with shorts built in. Some have a very athletic look, some a more classic look and some are a little sassy. All are very functional for the hiking trail with more freedom of movement, great ventilation, and a feminine touch. The fabrics are important. They need to be wicking fabrics that will wick the perspiration away from your body. They need to be stretchy for easy movement. They need to give protection both in warmth and also UV protection. 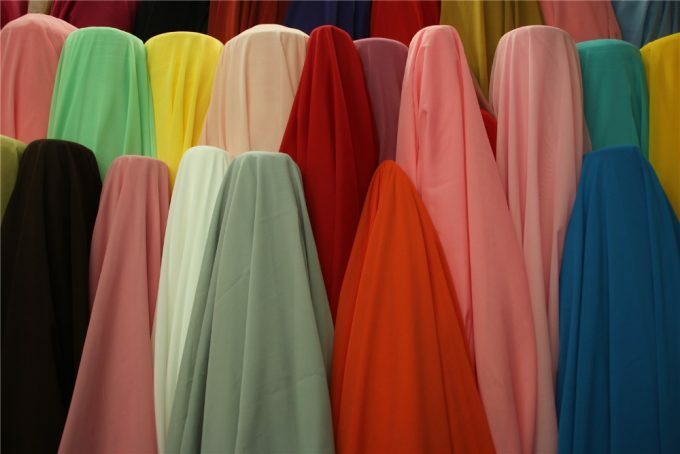 Best of all these fabrics are machine washable and are resistant to wrinkles. Synthetic fabrics were made to be versatile. They have properties we want in active wear. With Lycra, Spandex, and Elastane you get the stretchiness. With polyester and nylon, you get quick drying fabrics and fabrics that will wick away perspiration. Natural fabrics such as Merino wool also have great value. They are very breathable and also have wicking properties. Wool dries quickly. The technology of producing wool fabrics has advanced greatly in the last number of years. We now can get wool garments with a blend of Lycra to give it a bit of flexibility. The newer wool garments also are soft and machine washable. These features make wool a very viable fabric for outdoor clothing. 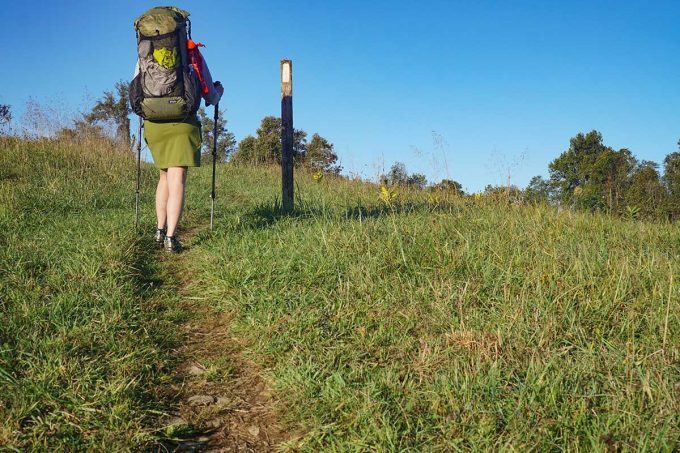 When considering hiking skirts the features that come to mind include pockets, zippers, belt loops, or any other things that come with the skirt that would be of an advantage to the hiker. Pockets are important so you can stash small things for easy access such as keys, money or lip balm. Belt loops would be handy. You could wear a belt for stability and attach other necessities such as a water bottle or camera. Even if you didn’t wear the belt, you could still use the loops. Zippers may be used at the waistline or the hemline. Zippers at the hemline can be opened up a bit for more ventilation. Of course, we are looking at hiking skirts but there are some skirts that also have alternative uses that may be worth mentioning. Most of the skirts we are reviewing can be used in any athletic/outdoor activity. Some are nice enough to wear every day or to go out for a casual dinner. That’s one of the nice things about skirts, they are so versatile. The Insulated Powder Cloud Skirt will add extra warmth for those high mountain hikes and ski trips. The skirt is insulated with 50-gram feather touch Thermatech insulation. It adds warmth but not bulk. It is moisture and wind resistant. The seams are reinforced to add durability to this garment. There is also a Lycra panel in back for adjustability and comfort. Another great feature is this cute skirt is machine washable. This garment will easily slide over your base and or mid layer clothing. 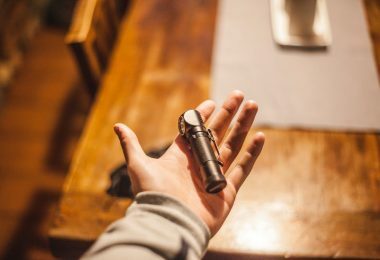 One shortfall is there are no pockets meaning no place to put your valuables such as keys, identification, and money. The skirt is a definite fashion statement; you will look good sitting near the fire at the local bar and grill. This skirt may add some warmth for you as you are snuggled up in your tent ready for some shut eye. The skirt comes in several eye-catching colors: black, aqua, melon and white. Each skirt has a contrasting color for the lining. For more protection, Arctix also has coordinating insulated pants in black, aqua, melon or white. Spend the day on the trail with the long pants and then relax in the evening in the skirt. 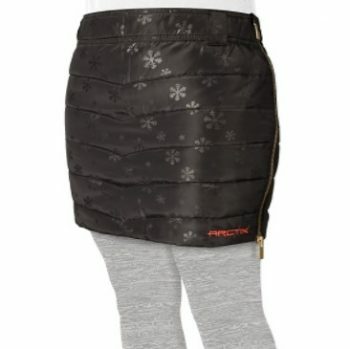 The Arctix Powder Puff Snow Skirt is the same skirt as the women’s Arctix Powder Cloud skirt only in girls sizing. 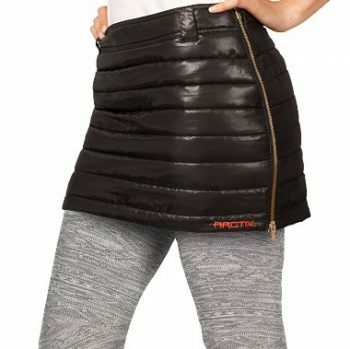 Made for cold weather and outdoor activities, this quilted skirt has nylon fabric on the outer shell and a 50-gram feather touch Thermatech insulation finished off with a taffeta lining. There is a Lycra panel in the back waistband for a comfort fit. It is moisture and wind resistant, which is a great feature for outdoor sports. This cute skirt comes in several vibrant colors with a tone on tone snowflake design: black, aqua, melon and white. The skirt is a two-tone color with the outer shell being one color and the inner lining being another contrasting color. The skirt is not reversible, however. Perfect over leggings or tights, this skirt will add the warmth you need. The skirt is very stylish yet functional. One notable drawback, there are no pockets. This skirt on a young daughter would look great paired with a mom wearing the woman’s skirt – like mother, like daughter. Also, check out the long insulated snow pants or bibs for girls. Perfect for wearing all day on the trail and then change to the skirt for relaxing in the tent at night. The bibs are also available in toddler sizes to coordinate the whole family. This versatile Merino Wool Skirt is suitable for the trail, home, work and the gym. Its classic A-line design is perfect for any figure. The wool and Lycra blend makes the skirt soft and stretchy for ease of movement. 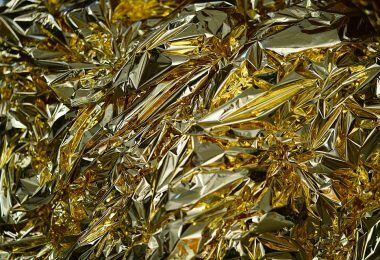 The fabric is considered a winter weight, so it is a heavier fabric that will add warmth and protect from the wind. This skirt is machine washable. The skirt’s hemline falls just above the knee giving it some modesty over a miniskirt. There is a hip pocket with a 6” zipper that will hold your personal items without fear of losing them. The skirt just slips on and can easily go over a base layer such as tights or leggings. The skirt comes in a variety of earth tone colors, perfect for concealing any dirt and helping you to blend into the trail backdrop. This skirt could go from the trail to a casual dinner with no problems. 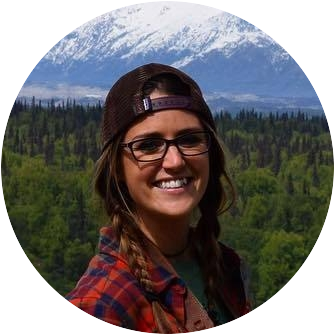 Ibex has a whole line of outdoor clothing for women. 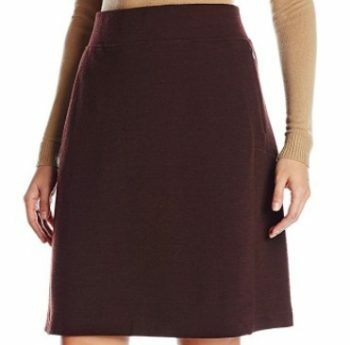 They have sweaters and vests that would pair perfectly with this Izzi skirt. This cute Sports Lioness Skirt has pleats to add that extra feminine touch. There are also built-in shorts for modesty. The fabric is polyester and spandex, built for durability and flexibility. The fabric is “peach faced” meaning it has been treated to make the fabric softer with a bit of fuzz that resembles a peach. The fabric has wicking properties. 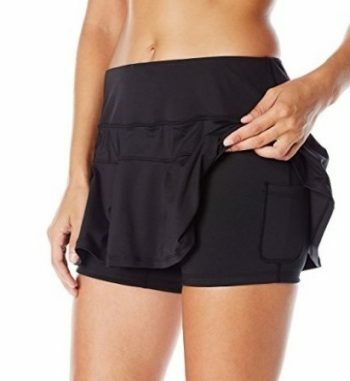 Another fabulous feature is these shorts have UV protection (50+) which is great when you spend a lot of time outdoors. The shorts have some great features such as pockets for your valuables or phone. There is also a music port so you can slip your headphones through and listen to your favorite tunes while hiking the trail. There is also a zippered pocket in the back. The hemlines of the shorts are lined with little grippers to keep the legs of the shorts in place during any athletic activity. This skirt comes in a multitude of colors and patterns. Skirt Sports has a variety of tanks, Ts and jackets that would look great with the Lioness Skirt to make a complete outfit. The Ziji Sport Skirt is made of breathable, stretchy fabric that will go the distance with you no matter what your sport. The skirt has a pair of “boy shorts” attached underneath the skirt. The shorts are gusseted to add more flexibility and ventilation. The polyester/Spandex blend is a wicking fabric to keep moisture away from the skin. It also dries quickly. The skirt is machine washable. The wide waistband will hold the skirt in place. The side slits add a bit of style as well as add ventilation. The skirt comes in two patterned colors: black neon and blue bubbles. The shorts have pockets that are easily accessed. This skirt has a 100% money-back guarantee. 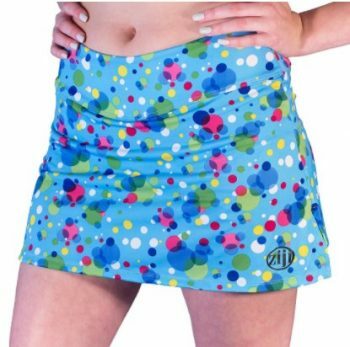 The Aqua Design Skort is your all around sports skirt complete with under shorts. The fabric is a poly/Spandex blend made to move with you for a complete range of motion. The double-stitched reinforced seams add to the durability of the skirt. The fabric is breathable and wicking. 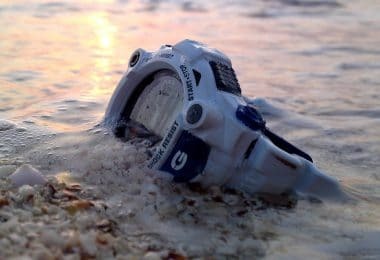 It also has UV protection of 50+; great protection for those long days in the sun. The skirt is machine washable; and quick drying as well. The discreet pockets in this skirt will accommodate keys, credit card, and phone. There are four fashion colors: black water, pink water, blue ripple and green bayou. Each skirt is black and then trimmed in one of the mentioned colors to give a nice contrast. There are side slits for extra ventilation. This skirt comes in plus sizes too for the fuller figured woman. This skirt is part of an activewear collection so you can purchase coordinating items to complete your outfit. That completes our list of best hiking skirts. As you can tell, there are 3 skirts geared toward cooler weather as in fall and winter seasons and 3 skirts geared toward warmer weather such as late spring through to early fall. Most of these skirts are made of a polyester/nylon/Spandex/Lycra blend of some sort. They possess great qualities such as breathability, ventilation, wicking properties, some have UV protection, reinforced stitching and machine washable. These are the things we look for in our sporting wear. One skirt is made of a Merino wool/nylon/Lycra blend. It too has many of the features we look for including breathability, wicking, and machine washable. Fortunately for those who don’t like to do the ironing, these fabrics all are wrinkle resistant. Aside from the fabrics and their abilities, the other key feature is pockets – a place to hold your valuables. All but two of these skirts have pockets. For hikers, it might not be quite as essential because you will most likely be carrying a pack that will be able to accommodate your valuables. But in the instance you are wearing your skirt for other purposes you would need to bring a handbag of some sort to carry your personals in. A girl always thinks about fashion. We always want to look our best. These skirts are very cute and fashionable in the right setting. Some skirts look great with leggings or tights, especially for the fall or winter months. Since the summer skirts have built in shorts, you may not want to wear anything else with them unless you find a very thin pair of leggings, either long or Capri length. Most of these skirts are made by name brands that also carry coordinating garments to complete your whole ensemble; that way you can get a matching top for your skirt. The good news is that skirts are accepted attire in every setting – even the outdoor sports world. 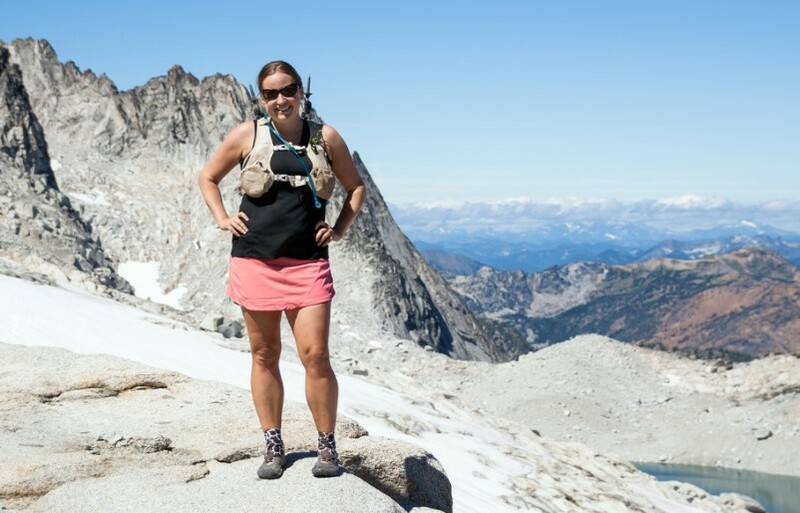 Skirts are versatile and can be worn on the hiking trail, cross-country ski trail, running track, biking route, and every other sport conceivable. Play like a girl – wear skirts! P.S. 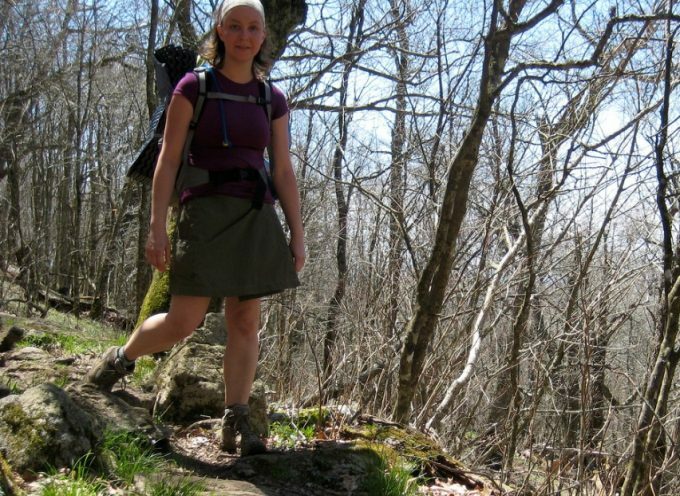 – I know the guys reading this are envious and wish they could wear skirts on the trail too. Search the Internet and check out the kilts available online. 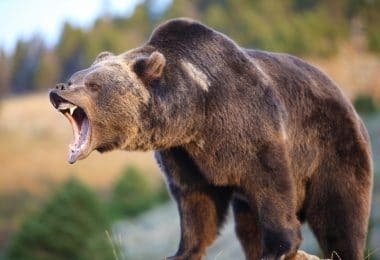 Some of them are very manly and would be great on the trail! Best Camping Knife: Step up your outdoor game!